When we combine an awareness of loss and suffering with an optimism that we can make a difference, we can be motivated to take remarkable steps to end the loss and suffering. Look at the money that has been raised, and the important research that has been done with that money, in our collective fights against cancer, AIDS and other diseases and medical conditions. There are the fund raising efforts for those hit by natural disasters, the most recent being the fund raising efforts to help those impacted by the typhoon in the Philippines. There are countless local examples, one being a group of my friends currently working towards what had seemed by some to be an unreachable goal to raise $50,000.00 to help out a friend in need. A keen appreciation of the loss is a necessary motivational ingredient. The light of hope is also necessary. We are not going to throw our hard earned money, or our time, at something unless we feel that our contribution will make a difference. The focus of this “Achieving Justice” column, has changed over the several years that I have been writing it. With my continual exposure to the losses caused by road traffic incidents, I am continually reminded of the significance of those losses. With the growing voice I have had, thanks to the Capital News, I have become increasingly hopeful that my voice can make a difference. The losses are, indeed, incredible. 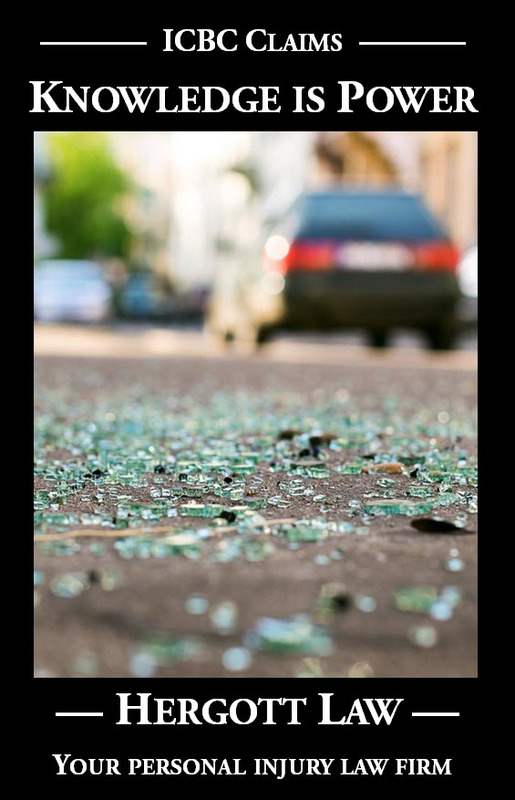 A road traffic incident claims a life in British Columbia approximately every day and a half. Someone is injured in British Columbia, on average, every approximately 6 ½ minutes when the total number of injured victims per year is spread over every hour of every day of the year. Many of the injured will never recover. Those who lose loved ones, of course, never stop feeling that loss. Totally apart from the personal losses, the economic losses to the Province of British Columbia are staggering, to the tune of upwards of ten billion dollars per year (the assessment was $8.8 billion in a 2007 study). That’s twice the annual budget of British Columbia’s Ministry of Education, and approximately one-half that of the Ministry of Health. This Sunday, November 17, 2013, is the World Day of Remembrance for Road Traffic Victims. A “day of peace” has been proposed as a global initiative: “A day of respect by and towards all road users; a day on which exceptional care is taken by motorists; a day of courtesy at the wheel and a day when all road laws are respected so that a world day without crashes resulting in injury or death will become a reality”. The national day of remembrance follows on Wednesday, November 20, 2013. 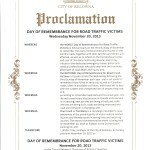 At my request, our mayor, Walter Gray, has proclaimed that day as the Day of Remembrance for Road Traffic Victims in Kelowna. 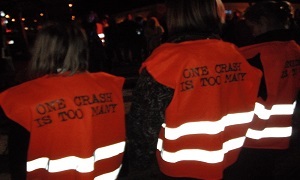 Please join me that evening as I lead the second annual event commemorating that day at the Orchard Park Mall parking lot, corner of Dilworth Drive and Highway 97, at 5:00 p.m.
By gathering together, we can help raise awareness of the losses caused by road traffic incidents and what each and every one of us can do to contribute to the solution. This is not a call for donations; it is a call for action.